The world is at a loss with the disappearance of Reed Richards, Sue Storm, and their children. 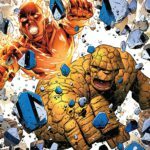 Half of the Fantastic Four is gone, and the surviving members and the rest of New York City are adjusting to the loss as Fantastic Four #1 begins. Johnny Storm is famous. He is loved for his high flying burning antics and seems to have moved on from the loss of Richards and his sister Sue. Ben Grimm, the Thing, is trying to put his life together, a life that includes his girlfriend Alicia Masters. While Johnny is his cocksure self and Ben seems content in his world of grocery shopping and getting a pet, they both miss their friends. Ben has moved on from his grief, but for Johnny Storm, it only takes a false alarm to bring the grief from the depths of his soul to the surface. Being told for some time that Reed and Sue are gone, Johnny flies to the sky demanding that Reed give him a sign because he never accepted that they were gone. Reed and Sue were too clever, too smart to be lost in the cosmos. Reed and Sue are alive, and they do get a message back to Earth, which brings smiles and relief from all. Meanwhile, on the other side of the world, another person rises. Forced out of hiding, Dr. Doom is called upon to liberate his people, setting the stage for a coming confrontation. 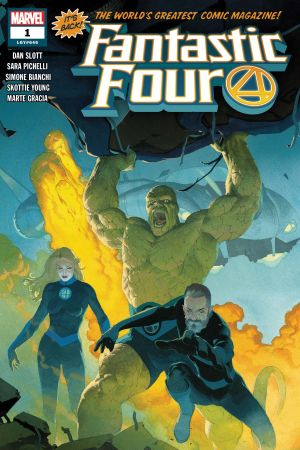 Its been a while since we have had the Fantastic Four together and as this first issue in the new series starts, readers are treated to a moving tribute to comic book legend Steve Ditko. Co-creator of multiple characters spanning thousands of comic pages, Ditko’s legacy will be remembered forever, and to see this tribute was a perfect way to start the new Fantastic Four series. Comprised of two separate sections ‘Signal in the Sky’ and ‘Our Day of Doom and Victory’ Fantastic Four #1 is not your typical reboot of a series. This is the first issue in the new series, and it was very relaxed. As exciting as it is to watch the Thing buy groceries with his girlfriend, I want to see him clobber someone. Then it dawned on me, the Fantastic Four didn’t end. Half of the four survived, and with the loss of Reed and Sue Storm, we watched the grieving process and how people are able to cope with traumatic events in their life. Johnny Storm has always been a hot head (pun intended) and it only makes sense how much he couldn’t accept the loss of Reed and his sister Sue. What is most surprising, is that Ben Grimm the man who is known as the Thing, as strong as a rock, coped with his loss in a different way. He saw his relationship with Alicia as a chance to build a new family and that was how he was addressing the loss. Grimm and Johnny have always bickered and fought like brothers, but in Fantastic Four #1 we get to see how their relationship has evolved. Rather then look at them as fighting brothers who tolerate each other, Ben has shown a great responsibility and love for Johnny. 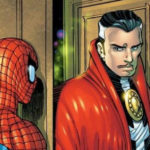 Asking him to be his best man at his upcoming wedding, shows how much Grimm thinks of the young Johnny Storm. Even though Johnny protests that it should be Reed being asked and not him, I think Grimm would have asked Johnny even if Reed and Sue hadn’t disappeared. Thankfully we do get some message from the lost Reed and Sue, and readers are left wondering what will happen in future issues. To complement this evidence of Reed and Sue, we see their archenemy has risen from the shadows. 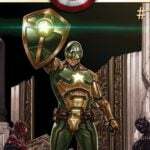 Victor Von Doom has been called out of hiding to help liberate the people of his homeland Latveria. While others have seen the mask that Doom wears as fearsome, the people of Latveria see the mask as a face of hope. 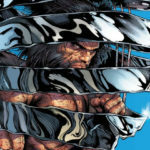 Writer Dan Slott, Sara Pichelli, and Simone Bianchi, have restarted Marvel’s first family, and their fiercest enemy. They did it without even having them all in the same story together. That’s what the next issues in the series will be about. I for one look forward to seeing how Reed and Sue come back, and what face Dr. Doom will show. Sure, he may wear his mask, but Doom has worn many masks as he alluded to in the story. When the reunion party is over, the Fantastic Four will have to deal with Dr. Doom. I give Fantastic Four #1 a rating of 3 Human Torch’s out of 4. We get the groundwork for the coming new series, a tribute to Steve Ditko, a look at what the Fantastic Four’s archenemy is doing, but it would have been nice to have seen all four members of the group in the story together. Just a small complaint for an enjoyable restart to this series.